Roland’s PLUG-OUT introduces a new way to deliver electronic musical instruments. You get a plug-in you run on your computer, but then the same sound-making code can be loaded onto hardware – the AIRA SYSTEM-1 synth keyboard. The good news is, the future-y stuff all works perfectly well. As we reported in our initial hands-on, when the installation works, you can use the software alone, the SYSTEM-1 alone, or a combination, which is a nice arrangement. The bad news is, the old-fashioned “install the plug-in and it works in your DAW” part? Well, for some – not so much. We’ve assembled as much information we can on what works, what doesn’t work, what Roland says we can expect from them by way of updates, and how to use free tools on OS X and Windows to get your SYSTEM-1 working right away. The first problem is, the actual plug-in for the SH-101 “PLUG-OUT” has been built for only certain plug-in formats. 64-bit AU is now fairly popular (Apple’s Logic Pro X and GarageBand support it, for instance). But VST3, while released last year, is incompatible with a number of popular hosts (like Ableton Live on Windows, for instance). We’ve also heard from readers with older, 32-bit versions of DAWs running into trouble. Updated: We can verify that the AU plug-in was not built for OS X 10.6.x. VST3 may work on that version, but not AU – even if you have a 64-bit host (like 64-bit Ableton Live). You need a minimum of OS X 10.7. That’s not uncommon for a lot of music software today, however. Roland realizes how important host compatibility is to SYSTEM-1 customers and we intend to support as many hosts as we are reasonably able. While compatibility is currently somewhat restricted (64-bit AU and 32/64-bit VST3) we are now examining options that would expand PLUG-OUT host support. One specific avenue that’s being considered is support for both 32-bit and 64-bit VST 2.4. That could theoretically solve the bulk of remaining compatibility issues. Along with that, we are diligently pursuing sporadic reports of some users having trouble with 64-bit AU in some hosts on some computer configurations. There is no specific time-frame for an SH-101 update yet, but it’s being actively considered at this time. Widespread compatibility and a smooth user experience are priorities to which we are deeply committed. What can you do to make this work right now? Windows: SAVIHost – free VST host on Windows, though untested – would love to hear from readers. Use of the requested audio unit(s) require lowering the security settings for “GarageBand”. Are you sure you want to proceed? You do want to do this. 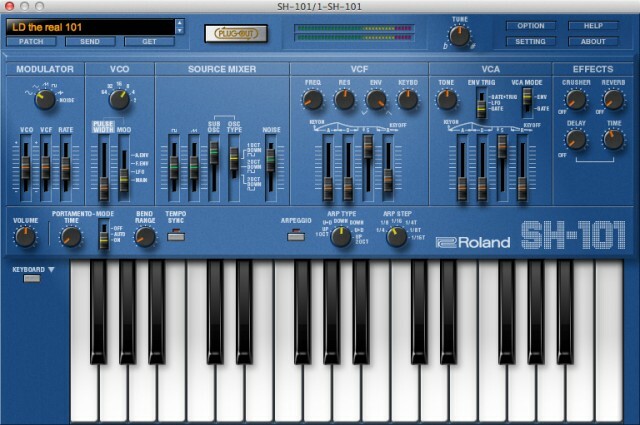 Trust me, the SH-101 didn’t steal access to my bank account and start buying itself synthesizer friends on eBay. Once you do this, at least, the solution works perfectly – and it’s free on every new Mac, so at this point, I stop complaining. The SH-101 even maps to some of the Smart Controls in GarageBand and Logic. The absence of additional plug-in support is puzzling. While the VST2.4 developer tools have been deprecated, the VST3 SDK software Steinberg releases to those making VSTs still supports creating the older format. It’s likewise possible to create 32-bit versions of 64-bit plug-ins. It seems from the absence of these formats – and the warnings when you download the PLUG-OUT about which DAWs have been tested – that Roland simply hadn’t time to test other DAWs. But based on the deluge of feedback we got from readers, what they got instead was a bunch of unhappy SYSTEM-1 owners who couldn’t use the software at all. Even stranger, Roland failed to release a standalone version. That would mean that SYSTEM-1 owners could install the new plug-in without worrying about starting a DAW at all. In fact, even before adding more plug-in formats, a standalone version of the PLUG-OUT software seems a must. Instead, if you install the SYSTEM-1’s 1.10 update, you get support for PLUG-OUT, but the firmware updater doesn’t add the SH-101 model. Part of why I hope Roland solves this is that the PLUG-OUT functionality works beautifully on the SYSTEM-1 hardware. Once updated, you don’t need the computer, which is part of the appeal. In the meantime, hopefully the information above does get you SYSTEM-1 owners up and running more quickly. Odds are you can find a compatible host, update, and get playing – and happily close your DAW, your laptop, yes, even CDM. We’ll let you know when Roland releases additional compatibility, and now, having slightly delayed things while we solved this, will get back to our SYSTEM-1 review (and other reviews and news)! If I had a Scottish accent and started talking about these things, I would sound like Malcom Tucker, so vendors, be glad I’m instead a mild-mannered Kentuckian.